Anxiety disorders can be characterized with excessive nervousness, persistent worry, continuous stress or tension, frequently without any reason or cause, as well as with feelings of fear or discomfort, accompanied with panic or depressive thoughts. Specialists define several types of anxiety disorders, including panic disorders, obsessive-compulsive disorder, generalized anxiety disorder, social anxiety disorders and phobias and post-traumatic stress disorder. General symptoms and signs of anxiety disorders include, first of all, extreme, persistent and long-lasting worry or excitement, muscular tension, emotional disturbances and discomfort, excessive irritability and being constantly suspicious of possible dangers. 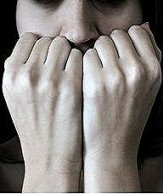 The symptoms of phobias are extreme emotional tension and desire to avoid the situations which seem to be scary to the patients. The symptoms of panic attacks are intense fears, inadequate behavior and hysterical or sometimes irrational responses, etc. As a result, the patient can demonstrate such physical reactions as high blood pressure, pounding heart, nausea, dizziness, changes of body temperature or skin color, and so on. Mental complications can include insomnia, nightmares, inability to concentrate, constant depression and pessimistic thoughts, sadness, continuous fatigue, de-realization and depersonalization, etc. Panic attacks can be accompanied with such reactions as sweating, shaking and trembling, pains in chest, problems with breathing, and others. Medical treatment (using sedatives or antidepressants, etc.) can be helpful for improving biological factors causing anxiety disorders. But different methods and techniques of psychotherapy (such as attending support-groups meetings, meditation, stress management, etc.) are more effective. Treatment of different phobias includes behavioral and cognitive therapies. Specialists suggest physical exercise, healthy eating, home-care and active life-style as other effective ways to treat patients with anxiety disorders.